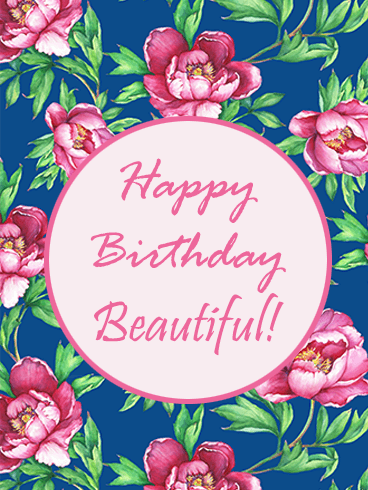 Happy Birthday Beautiful - You are beautiful inside and out. We dare you to look at this card without saying, "Aww!" It's simply adorable! 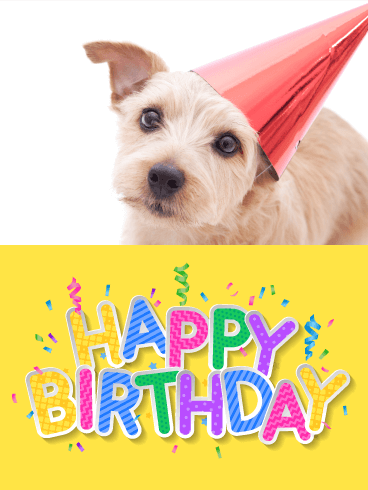 The cute pup will make everyone smile, while the party hat adds an element of fun. The yellow color of the bottom half makes this birthday card pop, while the bright colors of the lettering and the confetti make it a party in itself! A 30th birthday celebration? Groovy, man! 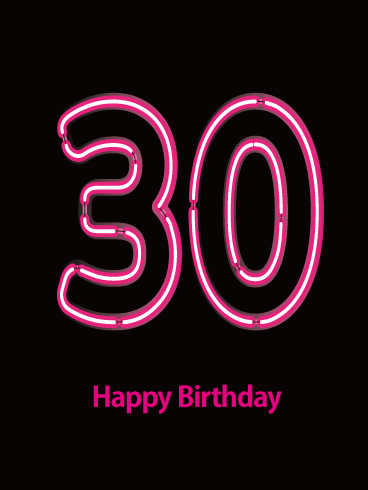 Like the neon numbers on this Happy Birthday card, birthday celebrations should be fun, full of light, and eye-catching. Though it can be hard to get older, the right birthday celebration can make the transition better. 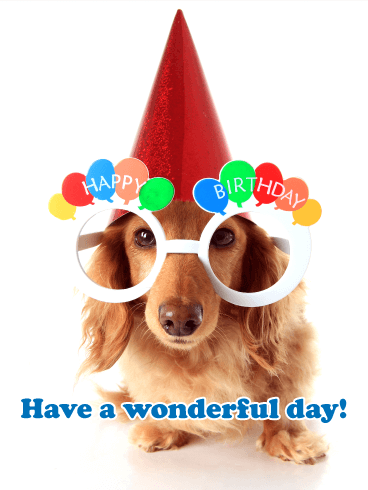 Your loved one deserves the greatest birthday ever, so use this fun Happy Birthday card to make this a great day! Your favorite woman is turning 50! She is the strongest, wisest, and most amazing person you know, so do your best to give her the birthday she deserves. 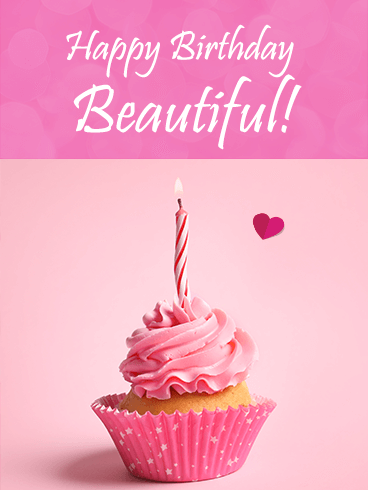 Everyone knows the best way to celebrate a birthday is with a cupcake, so use the fun and beautiful cupcake on this Happy Birthday card to wish your loved one the happiest of birthdays! Dogs are a fun addition to every day, but they're especially great on someone's birthday! The bright colors of this birthday card really make it stand out, while the oversized glasses and party hat make for an adorable, exciting picture. 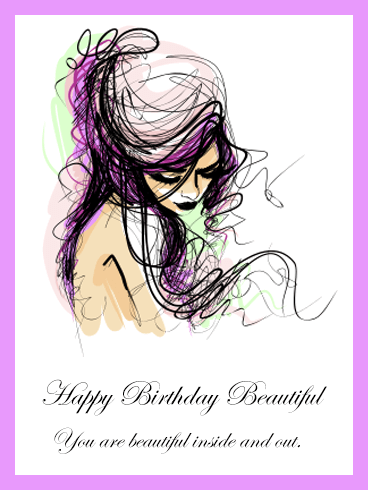 The sweet sentiment of wishing a wonderful birthday makes this birthday card a sure win for anyone special in your life. If you have a fabulous friend or family member, the best way to celebrate their birthday is with lots of pink, glitter, and pizzazz! 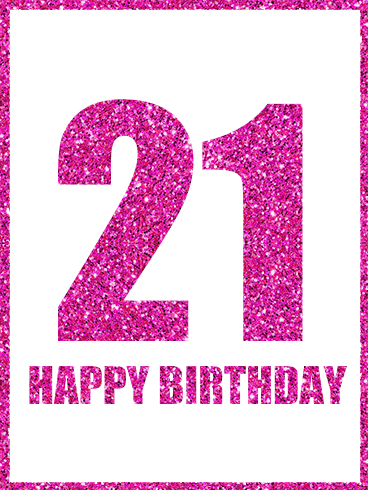 Turning 21 means the end of many social restrictions and the beginning of new opportunities for fun. With this shining Happy Birthday card, you can properly celebrate your loved one's special day with extravagance and fun! 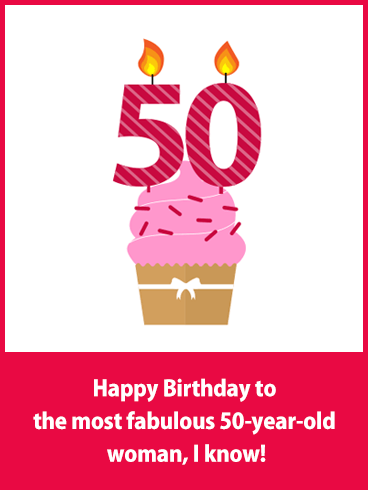 After celebrating 60 birthdays, you need a special birthday card to make your birthday memorable and amazing. 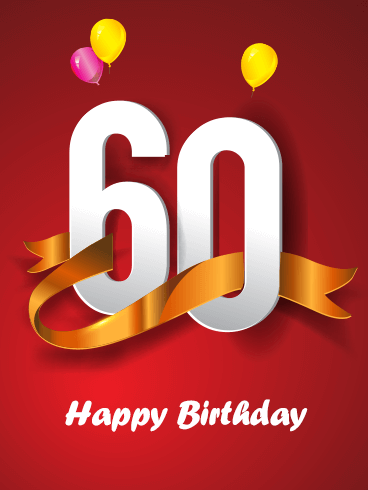 If you have a loved one who is turning 60, use this Happy Birthday card to celebrate their special day. You are immensely grateful for the 60 years your loved one has lived and you can't wait to spend many more decades with them. 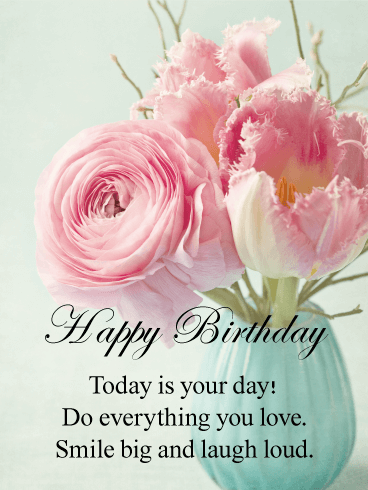 Use this Happy Birthday card to show your love today! Starting your 40s can be difficult, especially if you're a woman. 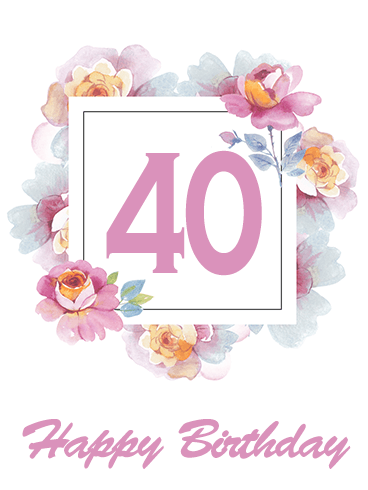 As your friend or family member celebrates their 40th birthday, bring some joy and love to this important day. 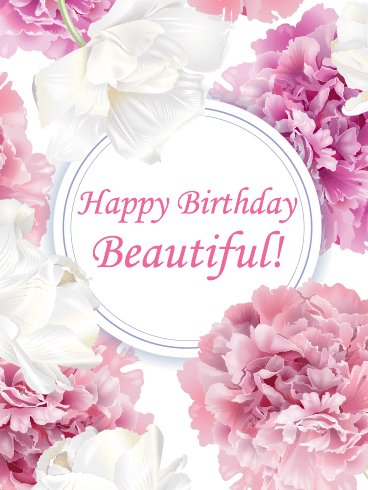 With the gorgeous flowers on this Happy Birthday card, you can show your loved one that age can never diminish her beauty. 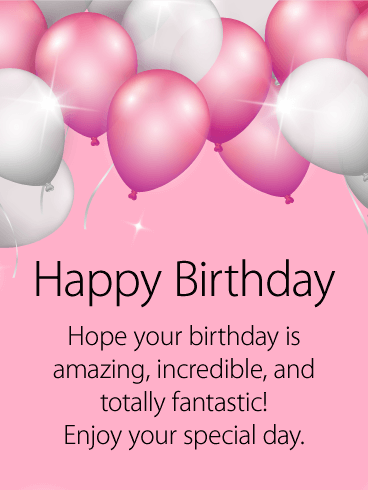 Give the best gift by sending this Happy Birthday card today!